I was first introduced to Zodiac late last year when their record Sonic Child came out. 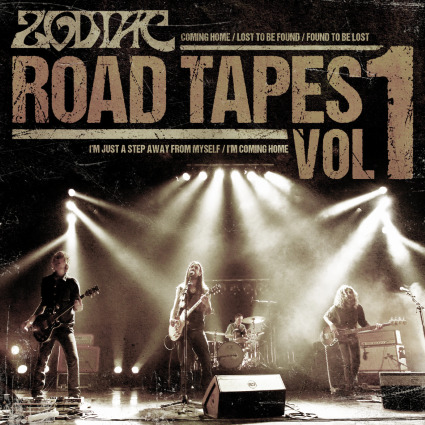 Now I sit here listening to their first live release Road Tapes Vol. 1 and I'm realizing that Zodiac are very much a force to be reckoned with. Slightly less spaced out and ethereal than their studio output Road Tapes Vol. 1 shows these blues rockers at their best - dominating the live stage and forcing punters into a stunned silence. Deeply emotive and wholly fascinating Zodiac understand the immortal spirit of rock and roll. I think that a big part of what captures my imagination about this record comes from the Thin Lizzy like majesty that dominates the live sound. Toss in a stellar cover of Cortez the Killer alongsides a few Zodiac classics and you start to get a sense that these guys are turned onto something much deeper. The sense of authenticity that dominates these tracks is perhaps what makes Road Tapes Vol. 1 so memorable for me. There is something deeply appealing about songs that speak so deeply to the human condition. Zodiac delve into the collective unconscious with largely improvised and intricate compositions that carry you off to a strange new world - and I love it. Yet even as the band seems to start to be fading off into esoterica they manage to come back down to earth with gritty and memorable rock riffs. Sure you can call these dudes out as being part of a revival music - but I get the sense there is something more to that. Sure the influences are clearly from 70's rock, but the fact of the matter is there is something intangible about Zodiac that is planted in the 2010's. These are the last remnants of Chuck Berry's music being pulled out of obscurity and into the light, enjoy them and fall in love with their undying magic. Zodiac's first album A Bit of Devil is a personal favorite. I think what separates Zodiac from their peers is pure talent. Not to take anything away from bands like Graveyard or Kadavar, both of whom I love, but the genuineness of the sound Zodiac produces comes from being on another talent level as players I think. They make retro rock that somehow ends up sounding timeless.